The Ocular Surface is a complex and delicate arrangement of organs at the front of the eye ball that provides a moist environment in order to perform the first steps of the Vision Process. The moist mucosal organs at the anterior side of the Eye Ball form a continuous Anatomical Unit. It consists of the Ocular Surface Proper (Cornea and Conjunctiva - the organs that are continuously bathed by the tears) and of the Ocular Surface Mucosal Adnexa (Lacrimal Gland and Lacrimal Drainage System - the organs that manage the tears, i.e. that produce them or dispose them, respectively). Regulatory Systems maintain the intact function of the organs and thus join the Anatomical Ocular Surface into the Functional Unit. The Ocular Surface is a pre-requisite for Vision. Moisture - by the tears - is Key at the Ocular Surface. 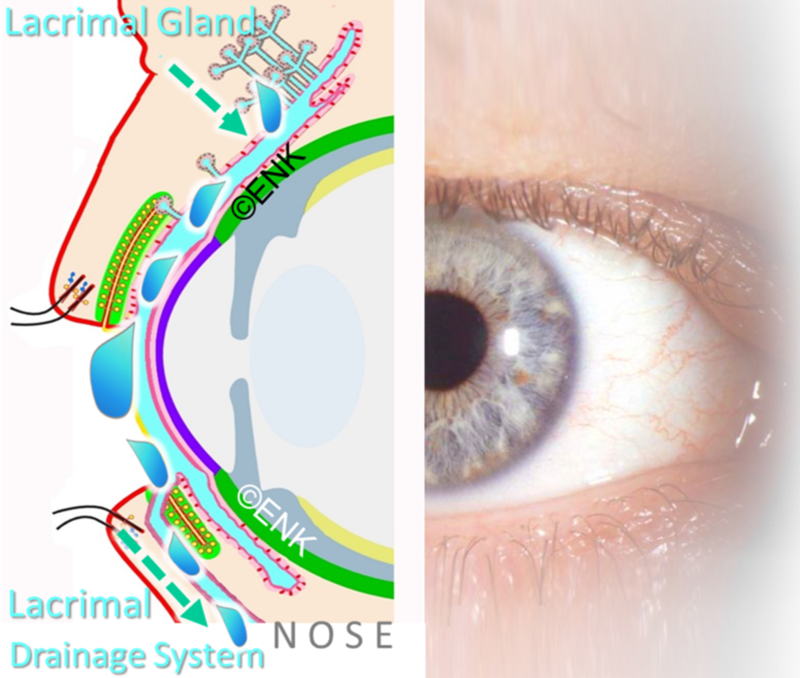 Moisture must be produced by the ocular surface glands - this is Secretion. Moisture must be spread into a Tear Film to provide permanent moisture in the palpebral fissure - this is Tear Film Formation. Dysfunction of the Ocular Surface Functional Unit leads to Disease - prototypic is Dry Eye Disease. Members of the Ocular Surface Center Berlin (OSCB) have devoted their scientific energy to the concept of an Ocular Surface Unit for about 3 decades. Nowadays this is a cornerstone for the conceptual understanding of health and disease at the ocular surface. The ocular surface consists of the moist mucosal organs at the anterior surface of the eye. They are a continuous anatomical unit from the lacrimal gland over the conjunctiva & cornea into the lacrimal drainage system. The ocular surface organs are joined by several systems e.g. the flow of tears along the mucosal surface and they are regulated by the same systems, e.g. nerves, hormones and the immune system - thus they also form a functional unit. The main function of the Ocular Surface is to provide the necessary equipment for VISION ... in the form of permitting the entrance of light into the eye and for its refraction. The Complete Ocular Surface ANATOMICAL UNIT. It consists of the OCULAR MUCOSA, i.e. the organs that are bathed by the tear fluid and of the MUCOSAL ADNEXA, i.e. the organs that manage the tear fluid, either by producing it, as the lacrimal gland, or by draining it after bathing, as the lacrimal drainage system. contains all components that the Cornea can not have in the interest of transparency, e.g. All the mucosal organs of the OCULAR SURFACE PROPER and of its mucosal ADNEXA are anatomically continuous and form an anatomical unit. The intact function of the Ocular Surface depends on REGULATORY SYSTEMS that support the growth and maturation of the organs and are also necessary for the actual functional regulation, e.g. of the volume of secretion or the frequency of blinking and many other functions that make the ocular surface feel well ... and also the individual who owns it. Furthermore there is a plethora of other soluble factors that come with the blood circulation or are locally produced and ensure the growth, maturation, regeneration and ´special functions´, such as protective reactions and inflammation, of the tissues and organs. The regulatory systems transform the anatomically continuous organs of the anatomical unit into the ocular surface functional unit. For more details please see e.g. the Section on ´Regulatory Systems´. The Ocular Surface is the first part of the vision pathway and therefore of utmost importance for everything that happens later and more posterior in the eye. The ocular surface provides the clear optical media for entrance of light into the eye and for its refraction to have a clear image of the outside world. can be drastically impaired or become meaningless IF the ocular surface is not intact. The ocular surface is thus of utmost importance for vision and any dysfunction or disease of the ocular surface immediately endangers visual acuity. The FUNCTIONAL UNIT of the Ocular Surface. The organs of the Mucosal ADNEXA, the lacrimal gland and the lacrimal drainage system. are not readily seen whereas the Cornea and Conjunctiva that constitute the Ocular Surface ´Proper´ can easily be seen and investigated in clinics. The Organs of the Mucosal Adnexa both ´manage´ the tears in the sense that they either produce the new tears or drain the ´used´tears - whereas the Cornea and Conjunctiva are bathed in between by the tears. The organs of the mucosal adnexa, that are not readily seen in clinics, can be termed upstream and downstream of the ocular surface proper (cornea and conjunctiva). This points to the high importance of the tear fluid, that ´flows´ along this paths, to provide ocular surface integrity, health and function. The Tear Flow is along the Organs that constitute the Ocular Surface Functional Unit, i.e. from the Lacrimal Gland, through its excretory ducts on the Cornea and Conjunctiva and further through the Lacrimal Drainage System into the Nose. The BLINK movement of the Eye Lids spreads the Tears into a very thin and homogenous Layer of Tear Fluid - the Tear FILM - that keeps the mucosal Ocular Surface constantly moist even in the opened palpebral fissure during the interblink period. Moisture must be spread into a FILM of Tears in front of the cornea and conjunctiva at the anterior side of the eye ball in the palpebral fissure. The FORMATION of the pre-corneal Tear FILM is achieved by the Blinking movement of the eye lids. This Dilemma is elegantly solved by the Ocular Surface: the transparent cornea is constantly covered with a very thin and homogeneous tear film. By this ´trick of nature´ the mucosal surface is kept moist every-where and every-time and light can still get into the eye. The solution wouldn´t be half as elegant, if this ´trick´ wouldn´t provide another important function, because the very smooth surface of the pre-corneal tear film is at the same time the main refraction element of the eye and thus of the of utmost importance to achieve optimal visual acuity. ... here we already have a hint to understand, why one frequent symptom of Dry Eye Disease, that typically goes along with alterations of the pre-corneal tear film, is an unstable visual acuity. Dry Eye Disease is a prototypical disease of the Ocular Surface due to the dysfunctions that eventually impair the most basic functional complex of preserving moisture. When components of the ocular surface functional unit are impaired and thus become dys-functional beyond a certain limit, this includes a risk of downstream pathological consequences. All together the intricate network of structure and function at the ocular surface is keeping a delicate functional balance to preserve the moist mucosal niche in a dry environment ... and may easily become ill. In view of the complex task that the ocular surface has, it is fair to say, that the system turns out to be surprisingly robust in our daily lives. Nevertheless, many disturbances of the ocular surface functional unit, at least when they are chronic, can lead to pathology. This will eventually also affect the most basic functional complex of the ocular surface - which is the provision of moisture. Therefore Dry Eye Disease is a prototypic disease of the ocular surface.